A few months ago I asked you to introduce yourself, to tell me more about who you are, where you live, what you like to do in your free time and, most importantly, what you love to cook. I did not expect such a heartwarming feedback. I read each and every email and questionnaire entry, getting to know you all a little better. I can see you now, sitting at your desk during your lunch break, checking the last blog entry to search for inspiration for dinner time. I see you in your kitchen in the cold morning light, with a cup of coffee, reading the newsletter and pinning a recipe to cook for your children or grandchildren. I learnt about what excites you in the kitchen, which are your favourite ingredients and where you prefer to shop: at the farmers’ market, obviously, but also in specialty stores and at the local supermarket, as the time you have id never enough. You told me about your struggles with picky children or with a scarcity of time to cook, as you would gladly dedicate blissful hours to this enjoyable activity, if only you had the chance. I cried a few times, too, moved by your sincere comments and loving words. You generously shared with us your personal stories, your most important food memories, the cookbooks you use daily. You made me laugh, reflect, you gave me endless inspiration and yet another reason to share these recipes with you. I feel blessed to count you among my readers, selfless, passionate, curious people. Expect more of these recipes in the next months. Email me if you want to know something specific about Tuscan cooking, if you search for a lost recipe of your Italian heritage or simply if you have a picky child who would just eat chicken breast. We’ll work it out together. This recipe is for you, Rebecca from Devon. You told me your personal story, which was one of the most touching and generous sketches of life I received, and that you were searching for lamb dishes, so I thought to make you a little surprise. Ask your butcher to mince some lamb shoulder for you, bake some butternut squash to give moisture to the meatballs and serve this to your family. It will warm up a cold English night with a Mediterranean vibe. I’ve been thinking about these meatballs since I made my late summer version, with beef and eggplants. I’ve been using carrots, white onions, leeks and mushrooms once eggplants, my favourite summer vegetable, went out of season. Finally I found in butternut squash a convincing substitute. 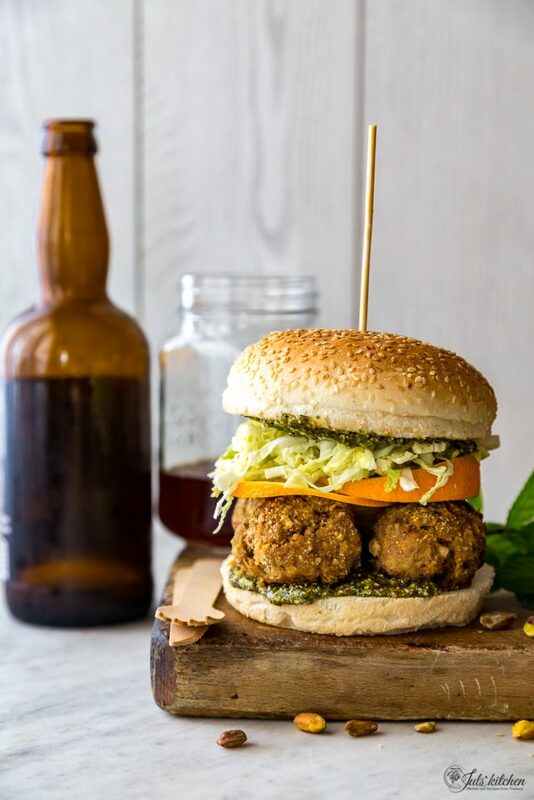 Serve these meatballs with a nut pesto, where pistachios and pine nuts team up with mint, that is the natural complement to lamb meat. Prepare also a salad of shredded cabbage and season it with extra virgin olive oil, salt, black pepper and a squeeze of orange juice. Better still, add a few wedges of orange directly into your salad. 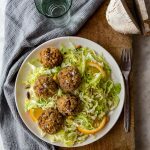 The butternut squash and lamb meatballs have a distinctive flavour, they are moist and sweet, with a warm orange hue. Brighten them up with a spoonful of pesto and a few wedges of orange and serve them as a main or into a soft bun if you have leftovers. Slice the butternut squash into thin slices and arrange them onto a tray lined with parchment paper. Brush the butternut squash slices with extra virgin olive oil, then season with a sprinkle of salt and a few grinds of black pepper. Roast in the oven for about 20 minutes or until soft and caramelized on the edges. Remove the squash from the oven, let it cool down for about 5 minutes, then reduce into a thick paste with a blender. Scrape the butternut squash paste into a bowl and add the ground lamb shoulder and a finely chopped onion. Season with salt and a few grinds of black pepper. Shape the meatballs into clementine-sized balls with the help of an ice-cream scooper: using the spoon you’ll get meatballs of the same size and the procedure will be a lot less messy. Collect the meatballs in a tray dusted with breadcrumbs and shake the tray to coat the meatballs with the breadcrumbs. 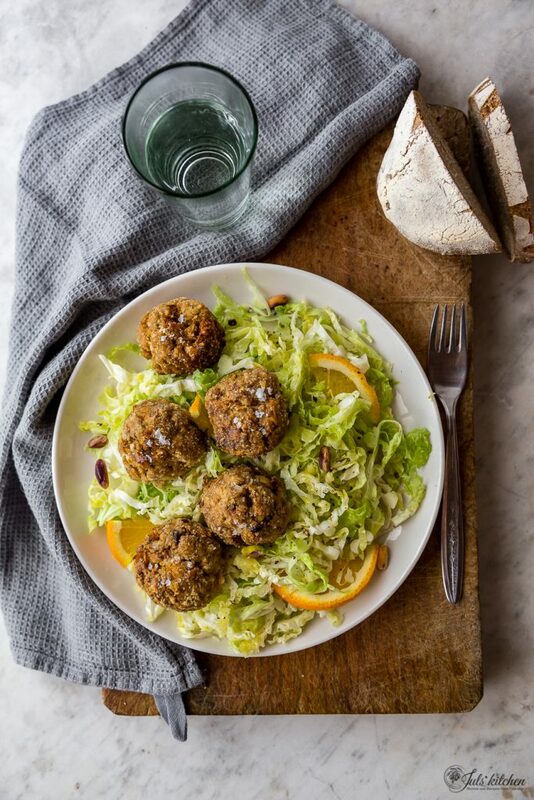 Arrange the meatballs in a tray lined with parchment paper and drizzle with extra virgin olive oil. Cook in the hot oven for about 20 minutes, or until golden. In the meantime prepare the pesto which will be a fresh and minty sauce to serve the meatballs. Blend pistachios, pine nuts and mint leaves together, adding the olive oil until you get a thick and quite smooth pesto. 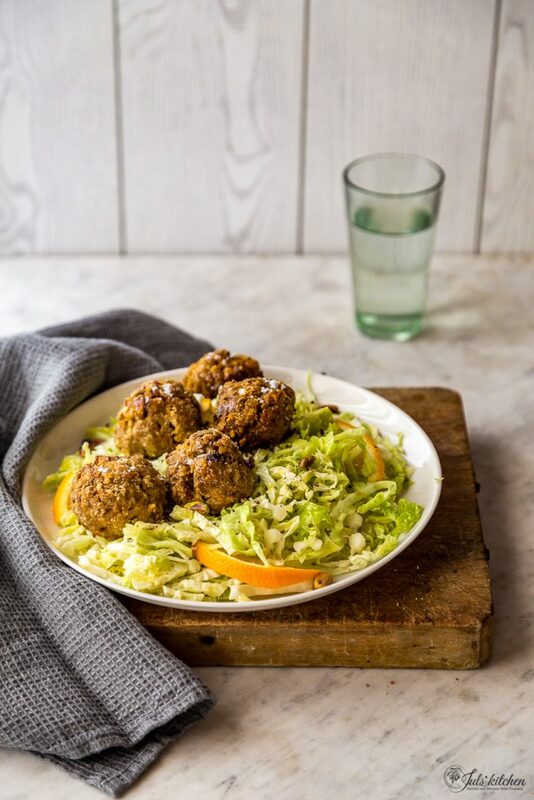 Serve the meatballs with the pistachio pesto and a salad of shredded cabbage seasoned with extra virgin olive oil, salt and orange juice. Have you seen the news? You can now find us on a brand new Facebook group, Cooking with Juls’ Kitchen, where you can share your experiments and the recipes you made from the blog, questions and requests. The focus will be the honest and seasonal Italian cuisine, the recipes you want to make on a daily basis, something to inspire your weekly meal planning, a way to access Italian cooking, sharing this curiosity with other people. It will be a way to see the behind the scenes of the blog, to understand how we get to a new post and a new recipe. Once the group gets off to a good start, we could also cook together recipes chosen by the participants, choose weekly goals, learn together the basics of the Tuscan and Italian cuisine with videos and Q&A sessions… Let’s start and see where curiosity and enthusiasm will bring us. On Instagram we chose a specific hashtag, #myseasonaltable, where we will collect our seasonal recipes. You can already find some inspiration, usually our improvised lunches. 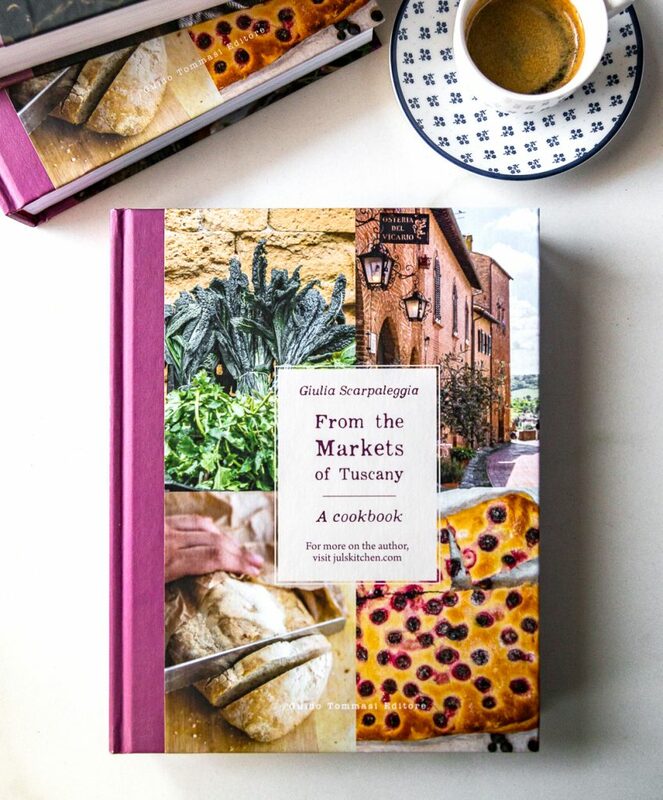 They will not be structured recipes, just tasty ideas, a quick guide to what is in season and that abounds on the market stalls. Use it to share what you are cooking right now. We also opened a new profile, @myseasonaltable, where we will gradually repost some photos selected from those published with the hashtag. Find me there for last minute ideas. There are already a grilled radicchio and a pan of artichokes waiting for you. You can read the post where I asked you to introduce yourself, along with an olive oil and rosemary cake. Feel free to answer the questionnaire or send us an email, we’re still curious to hear from you. We’re mad about Bullet Journal! Trying to be more organised, both Tommaso and I opted for bullet journal. Have you ever used it? which is your favourite way to keep yourself on track and perfectly organized? We’ll tell you more about our recent trip to Dublin, which has been such a revitalising break, but I just wanted to share with you the beer I loved the most there! I tried the Porterhouse Oystrer Stout, made with oysters! I was captured by how balanced, smooth, sweet but also slightly savour it was. I just finished On Writing Well: The Classic Guide to Writing Nonfiction by William Knowlton Zinsser, a refreshing manual and a classic. Now on my bedside table Consider the fork, by Bee Wilson, along with a sharp sarcastic Italian book which mocks the chef stars, Lenticchie alla Julienne. Vegetarian lentil ragu. A gift and a pasta dressing I start with the breakfast. Butternut squash cake Giulia’s Sense of Fashion. Butternut squash risotto with clams Gluten free butternut squash bundt cake. Things you bake after a walk. We moved back to the US from San Casciano last year. I love reading your posts, it brings back such fantastic memories. I miss your wonderful market and the pastries at Mario Barone. I made this tonight for myself and my toddler, and we loved it. I did add some cooked lentils for texture. Next time I may add some sautéed chopped mushrooms too for more texture. We loved the recipe. Thank you and Tommaso for putting so much time into your blog.